8/3/03 - Started construction. 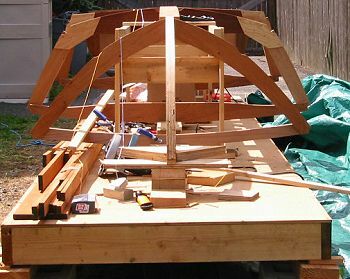 Built a wooden platfom in my backyard to construct the boat on. 8/5/03 - Received Frame Kit. One frame had a large crack in it, but appears there will be no trouble in getting it replaced. 8/10/03 - Built building form and begining to level/allign frames. 8/12/03 - Received replacement for the cracked frame. 9/7/03 - Fit the Keel, will epoxy it during the week sometime.